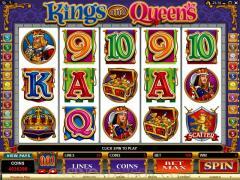 Kings and Queens is a video slots game that comes from the well-respected casino software company called Microgaming. A certified giant in the online casino industry, Microgaming provides a wealth of features in Kings and Queens, foremost of which is the 10 Free Spins that come with the added bonus of 8x multipliers. Fortune waits for the lucky Kings and Queens player in the form of the Treasure Chest symbol which functions as the wild symbol during the Free Spin section of the game. This symbol works in conjunction with the wild symbol of the base game–which is the King and Queens symbol–and when it takes the place of all the other symbols in the game (with the exception of the Shield scatter symbol), a royal treasure chest of winnings is up for grabs for the lucky player. Kings and Queens that offers 5 reels and 20 paylines of fast paced and high intensity slots action care of the award winning Microgaming casino software. 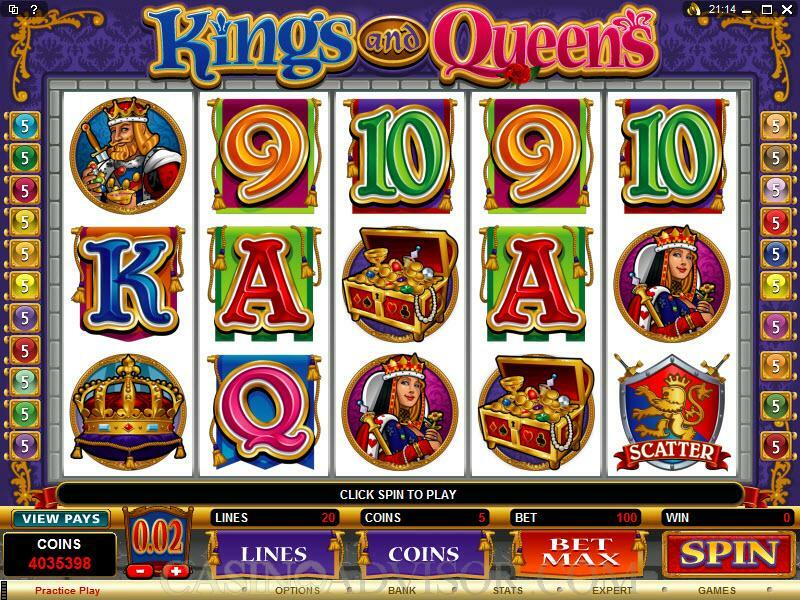 Introduced in March of 2009, the game is set to make waves in the online slots industry with a host of royal characters and objects in the form of kings, queens, majestic crowns, treasure packed chests, the valuable Kings and Queens symbol, a shield, and the now familiar A, K, Q, J, 10, and 9 symbols. Everything that you could ever want in a slots game is here, from wilds, scatters, free spin symbols, and even a gamble feature. The free spin round is a particularly exciting part of the game, and it is triggered by the appearance of 3 or more royal shield symbols. When this happens, you can get up to 10 spins for free, all of which can multiply your winnings by up to 8X. In addition, all of the free spins in the game can also be re-triggered. 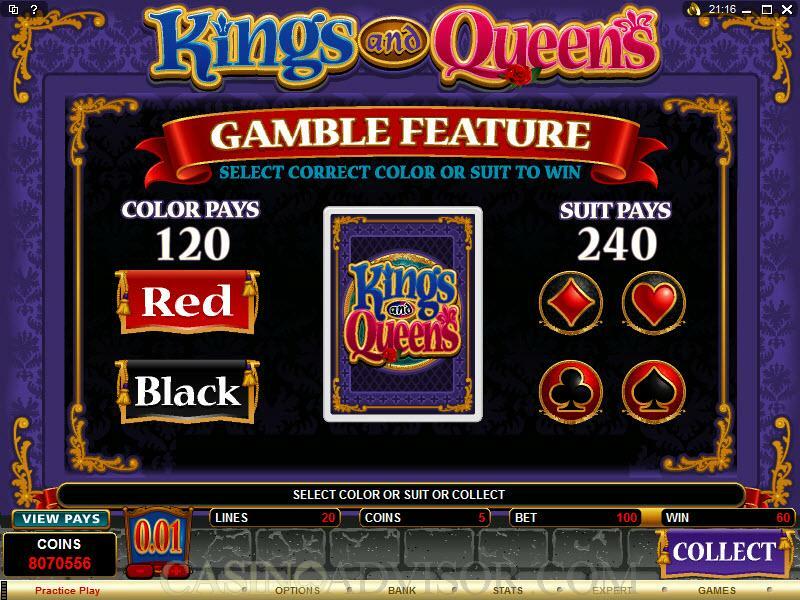 In the free spins section of the game, the Kings and Queens and treasure chest symbols can take the place of every other symbol in the game with the exception of the royal shield. This allows you a lot of opportunities to go for winning combinations in the free spin section. That's not all either! The game's gamble feature also allows you to double or quadruple your winnings, after which you can either cash out your winnings, or you can keep playing and hope to double or quadruple your winnings. Luck out and get the right color and you can effectively double your winnings. Getting the suit right can get you an even bigger prize by quadrupling your winnings! 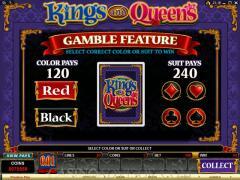 With all the winning opportunities offered by Kings and Queens, this is a game that definitely fit for royalty. Interested in reading more detailed information about Kings and Queens? If so Click Here for more details.